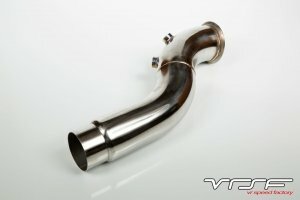 We are proud to introduce our VRSF 3.5" catless downpipe for your N55 F10/F11/F07 535i & 535xi, F12/F13 640i Coupe & Convertible, E70 X5 35iX & E71 X6 35iX (full application list below). This direct bolt on 3.5" downpipe is THE best bang for the buck mod available. By eliminating the restrictive catalytic converter in the factory downpipe, back pressure is reduced significantly which results in faster spool, an increase in power & a more aggressive exhaust note. Our catless downpipes feature a full 3.5" stainless steel design and are hand crafted from SS304 grade stainless steel. They also include a lifetime warranty as well as our "No Hassle" satisfaction guarantee (includes fitment). Made from hand crafted, tig welded 3.5" 304 grade stainless steel. Smooth radius bends to decrease turbulence and increase flow. CNC SS304 stainless steel flange. Gains from 25-30hp with tune.